Low-to-medium income families in Newcastle are one step closer to having the chance to live in affordable housing as construction on Evolve Housing’s (Evolve) Merewether Street development begins. The project involves the redevelopment of the former heavy rail line next to Civic Station, at 4 Merewether Street Newcastle, and will feature 30 residential apartments dedicated for affordable rental housing. It is anticipated to be completed by mid-2020. There will be 1, 2 and 3 bedroom apartment options, and three apartments set aside for Specialist Disability Accommodation. In addition, there will be three retail tenancies in the building, plus a ground floor car park and a communal roof top terrace area for residents and guests to enjoy. Evolve won the tender to deliver the project after a competitive Expressions of Interest process in 2018, and received development consent from City of Newcastle in December 2018. 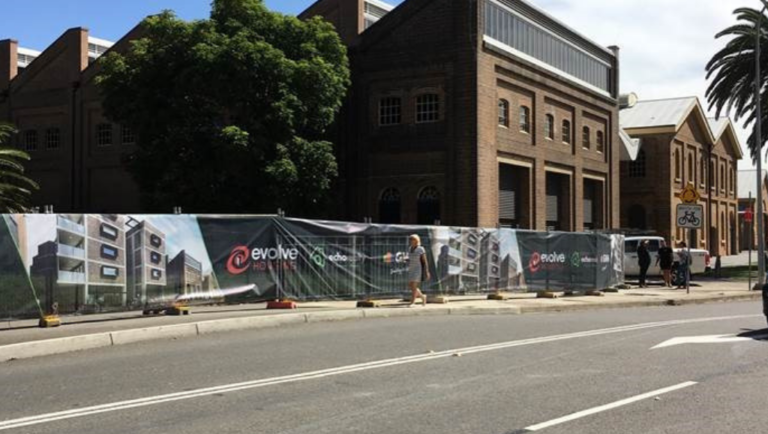 The purchase of the land from the Hunter and Central Coast Development Corporation (HCCDC) was finalised in February 2019, and Evolve recently executed a design and construct building contract with local builder GWH Build. Evolve Managing Director and CEO Andrea Galloway said that the project is an exciting development for the Newcastle area. “There is a real lack of affordable housing in the Newcastle region, and Evolve is very proud to be delivering this development so that families and individuals on low-to-medium incomes can rent a quality home without going into housing stress,” Ms Galloway said. “We have enjoyed working with the HCCDC and local construction services, and look forward to seeing the impact this important housing project will have on the community”. HCCDC Acting Chief Executive Valentina Misevska said the commencement of works was a major milestone for the city and a significant achievement. “Opportunities like this can be incredibly challenging to achieve, and so we are very proud to have had a role in presenting an appealing offering to market, and partnering with an operator that shared our vision. “It also demonstrates that we are committed to using our expertise in delivering urban renewal projects to enhance the fabric of the community and provide more diverse opportunities. Newcastle Lord Mayor Nuatali Nelmes welcomed the sod turning after City of Newcastle resolved last year to support the provision of more affordable housing. “Developments like this are important to building strong local communities,” Councillor Nelmes said. “We ensured that the rezoning included affordable housing and this is a good outcome for our community. GWH Build Managing Director Johnathan Craig said that GWH are excited to be involved in delivering affordable housing in the local area. “We at GWH are proud to be partnering with Evolve to deliver this important high quality affordable housing development in the inner city of our home town of Newcastle,” Mr Craig said. Nick Sissons, partner at Sissons Architects who worked on the project said: “This project provides much needed affordable housing to low income families and essential workers with all the social benefits to the wider community… it will make a positive contribution to the neighbourhood with clear yet contemporary references to the Heritage aspects of the site”.